Water kefir grains create a wonderful probiotic rich drink that is easy to get started and keep going in your own kitchen. 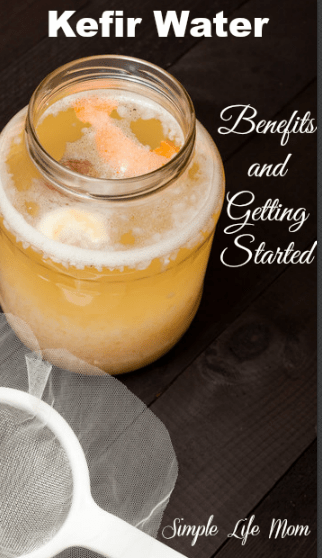 What are the water kefir benefits? All that and more is explained below. There is no “grain”, as in a seed from wheat or barley, in water kefir grains. They are called grains because of how they look. In actuality, kefir grains are made up of good bacteria and yeast (similar to that of kombucha if you are familiar with that: Learn more about Kombucha here). No gluten. No Dairy. Vegan. Non-GMO. Organic. Raw. What could be better? Just like yeast in a bread dough, kefir grains activate when given sugar. The sugar feeds the grains and is used up in the process, leaving you with a probiotic rich drink without any of the sugar! Crazy thing is, just like kombucha, it tastes sweet. Nice! Though you just need filtered water, sugar, and kefir grains to begin, kefir water tastes great when you add juices, fruits, ginger, and vanilla extract later on in the process. What Makes it so Healthy? There are a lot of water kefir benefits in the gut. Drinking kefir water helps restore the proper balance of good bacteria in your gut. With more good bacteria, the bad bacteria will not be able to survive and multiply. This makes it extremely important for restoring good bacteria and balance after taking antibiotics. Boosting your gut health means a much stronger immune system. A stronger immune system will help improve everything from frequency of sicknesses to allergies. Not only does kefir water have multiple strains of good probiotic bacteria, it also is mineral rich with magnesium, phosphorus, K2, D, B12, and more. With magnesium being so depleted in our soil, having a mineral rich supplement is important to making sure our nervous system and hormones are functioning properly. We all know that poor diet equals poor skin quality. Kefir water is a step in the right direction for replacing nutrient-less, sugary drinks with a delicious drink that is extremely healthy. Healing your gut will contribute to healthy skin by helping your body stay healthy from the inside out. High carbohydrate and sugar diets will cause your liver to become “fatty” and “clogged”. This is even seen in people who eat a “healthy, low-fat” diet due to the amount of sugar in granola bars, yogurts, and smoothie drinks. Sugar is the killer, not fat! 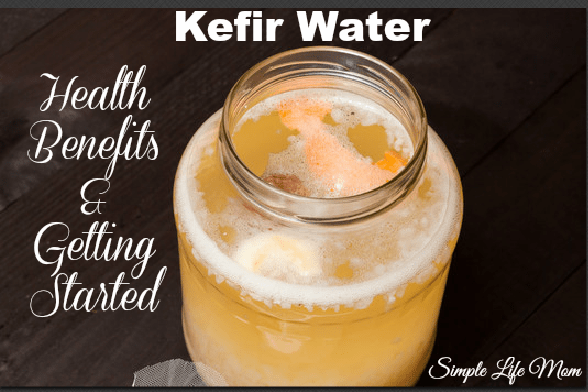 Out of all the kefir water health benefits, this is another really big one. By replacing sugary milks, large portions of fruit juice, and soft drinks with a probiotic, mineral rich non-sugar drink, we are taking a great step toward healing the liver. Detox doesn’t just happen from avoiding bad foods and replacing them with kefir water. Kefir water itself is great for liver detoxification because the probiotics, minerals, and vitamins work together to cleanse the liver of all toxin build-up. You can get started easily. The first thing you need is Kefir grains. If you know someone who has water kefir, ask them if they have a few to give you to get you going. Talk to them about their favorite recipes too. If you don’t know anyone who makes water kefir, you can get your own dehydrated grains HERE. You’ll make a sugar water mixture and allow the grains to re-hydrate in this liquid for 3-4 days. After the grains are re-hydrated you’ll make the sugar water again and put the grains in for 1-2 days. That’s it! You’ll want to keep your grains healthy, but there are ways to feed them without needing to drink water kefir every single day. You can also do more, like adding juice and allowing a second fermentation to give the cultures time to “eat” all the sugar to get those water kefir benefits. Here is a detailed How-To and Recipe article. Do you drink keifer water and kombucha? Which do you think is better for IBS? Kombucha helps more with digestive issues. It has more enzymes for breaking food down. Kefir has more bacteria strains, which is great for your immune system (it also helps with digestion, but not in the great amount that kombucha does). Thanks for the information about water-kefir benefits. I make kefir with milk, not will try using water. This is something I have been meaning to try – thanks for a list of reasons to stop procrastinating! I can hardly wait to read your detailed How-To and Recipe article. I’ve been wanting to do this… I will just simply have to take the plunge! The health benefits sound worthwhile. It’s SO worth it, health wise it’s a great benefit to have on hand.